Valentine’s Day is a special day for couples and is even more special when spent in Napa Valley. There is so much to see and do in Napa Valley and enjoying it on Valentine’s Day is a special experience. The wine, food, and beautiful landscapes have a lot to offer to couples who want to share Valentine’s Day in a special way. When you hear the words Napa Valley, you think about vineyards and wine. Napa Valley’s climate and soil made an optimal environment for growing grapes and you can experience Napa Valley’s finest vineyards all across the valley. The vineyards have special activities as well. From Merryvale Vineyards’ wine and chocolate pairings to Hess Collection’s Valentine’s Day wine and truffles, you are sure to find many ways to experience our vineyards. Another special way to spend Valentine’s Day here in Napa Valley is via a hot air balloon. Soar above the valley in a private hot air balloon for a unique romantic moment viewing all the vineyards from above. A special and romantic way to experience Valentine’s Day here in Napa Valley is to take the Wine Train. The Wine Train was established in 1864 and is a comfortable and unique way to spend time here. From the Dining Journey to their Winery Tour, you are sure to find something to meet your needs over Valentine’s Day and the weekend. The Wine Train has a violinist to make the time very romantic and unique. The train has lounging cars and dining cars to spend time in while you tour the valley. On Valentine’s Day, Cliff Lede Vineyards have a special romantic dinner planned with mozzarella pulling demonstrations, a multi-course meal, and live music. Explore Napa Valley’s own castle called Castello di Amorosa. 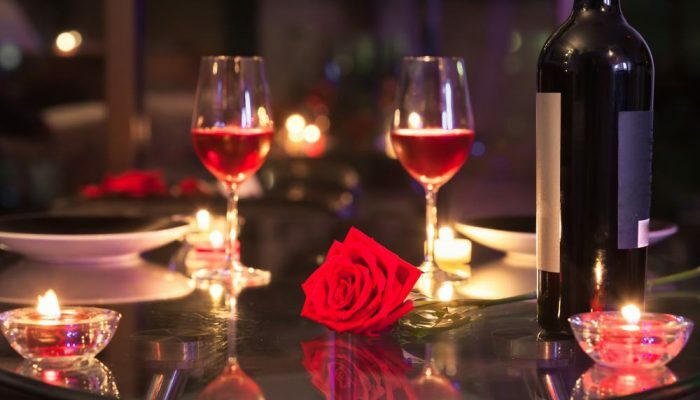 For the day after Valentine’s Day, Castello di Amorosa has a cabaret and Parisian-themed event with a four-course French meal, live music, and wine tasting making Valentine’s Day even more special. Many hotels throughout Napa Valley have special Valentine’s Day packages available for your lodging needs. River Terrace Inn has upgraded luxury rooms within walking distance of downtown. The Meritage Resort and Spa offers special Valentine’s Day rates with a six-course meal, Valentines-inspired spa packages, and candlelight yoga. Take the hassle of out of your transportation needs by using our luxury Napa Valley limo service. Why worry about travel when our services can meet all your travel needs. Our chauffeurs will provide a professional, comfortable, and safe environment as you travel across the valley. You are not tied down to any transportation schedule since you will set the schedule for your Valentine’s Day activities. We offer a Napa Valley car service to meet your unique needs, allowing you a stress-free travel experience. This will free up your time even more to experience all Napa Valley has to offer. Consider renting a luxury limo in Napa Valley through us to make Valentine’s Day even more special and relaxing. What Does Your 2019 Business Roadmap Look Like?